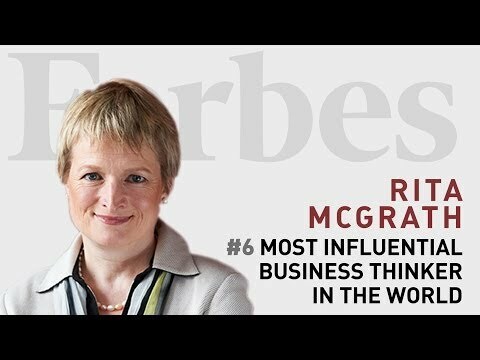 I had a chance to catch up with Columbia Business School professor and fellow author, Rita McGrath to discuss her latest book called – The End of Competitive Advantage: How to Keep Your Strategy Moving as Fast as Your Business (Harvard Business Review Press, 2013). I also look forward to seeing her speak about this topic at the upcoming World Business Forum held in New York at Radio City Music Hall on October 7-8. Tell us why sustainable competitive advantage really a failed notion these days? Because it causes companies to do a lot of dysfunctional things like just focusing on the bottom line. If you’re looking for things to stay the same and you’re looking for reasons to keep just doing what you’re doing every day, then chances are that you’re going to be taken by surprise by the changes in the environment or changes in the competitive intensity of your business or things that are just not going to take you in a positive direction. So the assumption that change is the weird thing and stability is the normal thing is something that causes a lot of companies to get taken by surprise. That’s why I argue that if you have this bias for sustainable (as in long-lasting, not as environmentally sustainable) it sets you up to make a lot of poor decisions in an environment that’s changing rapidly. So how should companies think about and organize themselves to take advantage of short-term sustainable advantages? The first big thing that companies need to do is to look at the elements of their business portfolio as an integrated whole, see that some things you’re doing that are driving today’s core business and that are going to continue to drive tomorrow’s core business. And you should keep doing them. Then you’ve got some things that you’re investing in which may be candidates to be part of the next generation core business, things that you’re doing today that could lead to a big, healthy business in the future. When Apple – just to take a common example – goes from making computers to making music players, but that’s an investment in one of these new platforms. Then you’ve got to have things that you’re working on that are what I call “options,” which are small investments you’re making today that buy you the right but not the obligation to make some kind of future investments or take advantage of some future opportunity but that you don’t necessarily have to follow through on. What does “good” in this new age look like? If you look in the book, there’s this set of ten growth outliers that I think get a lot of this right. The kinds of things that they’re good at doing are letting their structure change as their business opportunities change. Things like making sure that leaders don’t get too calcified in any one role or any one spot. Making sure that they do things fast, they make decisions quickly. Their pace is quicker than a lot of other firms. The problem with a lot of companies, particularly with respect to things like innovation, is that their structures were built to serve some of their business purpose in the past. So the structure they have today was built to help deliver yesterday’s business. When tomorrow’s business requires doing something different, you might need a different structure to go after it. But very often, the phrase I hear all the time is it “falls between the cracks” of the existing business. So what you want to be thinking about is building the right structure to deliver the business of the future. What role can marketing play in helping to define a new opportunity? Is it the classic role that marketing plays, or is it something more? I think it’s something different, and I think the world of marketing is about to undergo the most ginormous upheaval. And it has to do with the fact that on the one hand, the analytics that form the cornerstone of traditional marketing are really changing rapidly. When I was doing my PhD, it was all about conjoint analysis and co-word grouping and feature-function maps. Today with the advent of big data and the ability to combine data across many different, previous-unrelated databases, the onus on marketing to get really smart about how they use data and what discoveries they find from them is going to be very strong. There’s going to be a huge amount of pressure for that. So I’ll give you a specific example. My colleague at Columbia, Oded Netzer did a big data project involving the use of the entire Edmunds database. It was a big, involved study, but he was able to use social media mentions from the Edmunds database to identify the General Motors push to rebrand the Cadillac to be more in line with a European luxury car and less like an American family car, which is how many people were beginning to think of it. He was able to demonstrate that that a particular set of investments actually got traction in the perception of the brand using only social media. I think that’s totally different than a lot of the tools that are in the marketing toolkit today. What could this mean for the average marketer’s career? What does the ability to take advantage of these sorts of transient advantages mean for marketers? I would suggest – don’t let yourself get stale. My watchwords are – if you come to work every day and all you’re doing is coming to work every day, you’ve got a long-term problem! Moreover you’ve really got to know what’s going on out there. And I’ll give an example of a friend of mine at a big publishing company. She’d been let go and was meeting with a friend of mine who runs the learning and development department of this particular company. This marketing woman was saying I can’t get interviews. Or if she got interviews, she didn’t get offers because they want to know about things like search engine optimization, big data, social, and she had never had to learn any of that stuff. My friend meanwhile was completely outraged because she had arranged for online courses this woman could have taken advantage of, but she didn’t. The woman just came to work and did her job. As a consequence, she wasn’t even aware that a lot of this stuff was beginning to become a real for any company she considered going to. So the point is I think you’d need to constantly be thinking about where are your skills in relationship to where the demand is going to be? Are you learning new things? Even if you don’t directly and immediately see the connection between your job and those skills, are you learning something new on a regular basis? Great post, Paul. There are no certainties in life or business so it is up to marketers to keep learning and adapting all the time. Keep working and adapting to th4 demand of the future. Well said.